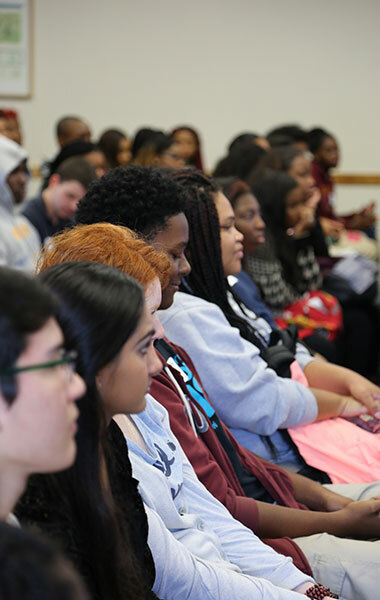 Building STEPS, originally an internship program, was developed in 1995 by Matthew Weinberg of The Weinberg Group, a Washington, DC based scientific consultant, with the express purpose of helping minority students become science and technology professionals. To better fulfill the founder’s vision and expand the outcomes for students, the organization was relocated to Baltimore in 2000 with enhanced and expanded programming. For 6 years, Building STEPS was operated from CEO Debra Hettleman’s home. The earliest cohorts had no more than 20 students. In 2006, while the first Building STEPS cohort was graduating from college, Building STEPS was gearing up for expansion. One year later, Building STEPS moved headquarters to Towson University and launched programming in 3 new schools, with a cohort of 34 students. Since 2008, programming at Building STEPS has evolved to ensure college completion for significantly more students. For nearly 2 decades, Building STEPS has been empowering students to realize their potential and achieve success. Building STEPS has grown from serving just 16 students from 3 schools to providing a continuum of innovative programming to over 130 Baltimore city public high school juniors and seniors and 250 college students and alumni each year.